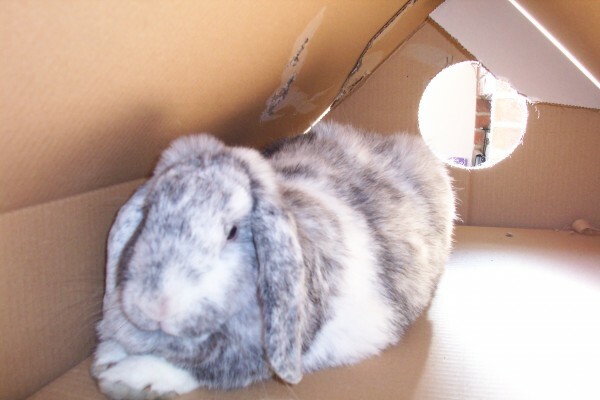 As Christmas approaches, Flopsy Girl has decided that we need to give our cardboard play house a makeover. She has decided that she would like a skylight in the roof for when we are upstairs. Well that's alright for her to say, but it's REALLY THICK CARDBOARD! I spent all night chewing at it from the inside, but I STILL have not managed to get all the way through it, and what thanks do I get? All Flopsy Girl can say is "Dandy, haven't you finished that simple job I asked you to do yet?" PS - Best wishes to Flopsy Girl. .... Thumper-Binx would be so proud. That's where our 2-foot got our playhouse from, and it's really, really great!